Incentive pay for teachers—why it’s a really dumb idea that needs to be abandoned now The idea that paying teachers bonuses if their students do well on tests has been gathering momentum recently, which is alarming because it is an idea that will cost a lot of money to implement, cannot be done fairly, doesn’t work, and has the potential to lower student achievement. First, despite the claims of the value-added proponents, we cannot divide up increases in student learning and allocate them to individual teachers. As Jesse Rothstein’s work shows, good teachers benefit their students for at least two years after they have stopped teaching them, and conversely, the total harm caused by bad teachers takes years to materialize. Second, we cannot use classroom observations to work out who the good teachers are either. While the work of the Gates’ Measures of Effective Teaching program, and the work of Consortium on Chicago School Research, has begun to tease out what teacher behaviors are associated with increased student progress, they are still accounting for less than 20% of teacher quality. So if we pay bonuses to teachers who rate highly on one of their observation protocols, we do know that, on average, the bonuses will go to teachers who are more productive, but the differences are small. And then there is a real danger that teachers who are currently highly effective in ways that are not represented in the framework will become less effective because of the incentive to ape the protocol in order to get the bonus. Third, a recent study showed that even $15k incentives weren’t enough to raise students’ scores, which suggests that teacher effort is not the problem. And from what we know about motivation (see Daniel Pink’s book “Drive”), performance-contingent rewards tend to lower performance on high-complexity high-creativity tasks. So what should we do? Pay teachers fairly, and let them get on with it. Create an expectation that every teacher should improve their classroom practice every year, not because they’re not good enough but because they could be even better. And create support systems that support each teacher in lifelong improvement. As part of my new position for our school district, I attended New Teacher Orientation for the first time since I was a new teacher myself. It was a very interesting experience. Being with all new people, who obviously don’t know me, they assumed at first that I was a new teacher as well. I live in the same small town that I teach in and everyone knows the teachers here, at least at the elementary and intermediate levels. If I’m not known as Mrs. M, they know me because of being M’s mom or S’s mom. People not known are the exception in this community. The town, while growing, is still small enough that we have only one of each building, elementary, intermediate, middle and high, even though there are 8 or 9 sections of each grade level. While I hadn’t really ever thought about my own new teacher orientation experience, sitting there with those new teachers today, I was instantly transported back to that day. Our meeting was held in the board office and at that time it was in a building that could best be described as ramshackle. It had cheap panelling on the wall, ceiling tiles and very worn carpet. Since then the building has been a flower shop and a beauty shop, as well as some other things I don’t remember. The meeting was held upstairs in the building around a table and I was on cloud nine to be sitting there! The adreline and excitement were so high that I don’t remember much of anything except going to lunch at a nice restaurant and a lot of paperwork. The piece of wisdom that stuck with me, wasn’t given to me during the New Teacher Orientiation, but came later that first week from my former kindergarten teacher . Think about that little gem of advice. As I’ve looked back at all I have learned about teaching since that first year, I almost feel apologetic to those first students. On the other hand, there is nothing that can replace the energy and enthusiasm and time you have as a new, young teacher. I loved that first group of students as much as I loved last year’s group. I still find myself a little teary that last week of school at the thought of never really getting to be together as a group in the same way again. The best piece of advice I can think to give new teachers is to take the time to establish relationships and routines. The FIrst Six Weeks of School has some great ideas for how to start building that all-important community in your classroom. 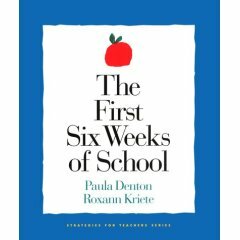 It is published by Responsive Classroom. They also have a great website and monthly newsletter. Check it out as you get ready for your new year!